When I woke up out of my tryptophan coma this afternoon, I realized that I missed Black Friday shopping. Not that I have money or the upper body strength to battle my way through the crowds. 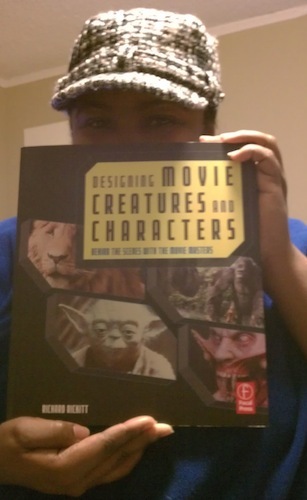 However, I did pick up a gem of a book the other day called, “Designing Movie Creatures and Characters: Behind the scenes with the movie masters”, by Richard Rickitt, printed by Focal Press. It retails from $36.95, but you can probably find it on Amazon for less. This book is specifically about monster makers. The book list the special fx makeup artist and their works. People like Tom Woodruff Jr., Alec Gillis, Steve Wang, Howard Berger and many, many more. You get to see pictures of sculpts, sketches and a behind the scenes look at the works in progress. If you are interested in finding out who is behind the movie magic of character makeup and animatronics, this is the book for you. I am happily making this my required reading for the holiday weekend.